Koalas are nocturnal marsupials famous for spending most of their lives asleep in trees. During the day they doze, tucked into forks or nooks in the trees, sleeping for up to 18 hours. This sedentary lifestyle can be attributed to the fact they have unusually small brains and survive on a diet of nutrient-poor leaves. Koalas tend to smell strongly of eucalyptus and musk. This is thought to discourage fleas and other animals from living in its fur. 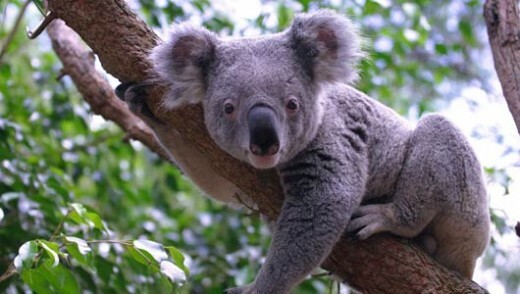 Koalas feed on eucalyptus leaves, especially at night. They do not drink much water and they get most of their moisture from these leaves. In Aborigine language, the word ‘koala’ means ‘no water’. However, koalas can become dehydrated in very high temperatures. Koalas have strong arms and legs as well as large feet with sharp claws that help them move about amongst the trees. They also have two opposable thumbs on their forepaws, enabling them to get a good grip when climbing trees. Although clumsy on the ground, the koala is an excellent swimmer, and may cross rivers in order to escape from heavy flooding in one area. What do baby koalas look like? Koalas are marsupials, meaning that they give birth to immature young that develop further in their mother’s pouch. A newborn koala is only the size of a broad bean, blind and hairless. It then spends its first six months inside its mother’s pouch. For the next two or three months it clings to its mother’s fur during the day, returning to the safety of her pouch at night. The koala mother and her young enjoy a very close relationship. She happily carries her offspring around constantly until it is old enough to be independent. What are the main threats to koala populations? The Koala is classified as vulnerable on the IUCN Red List of Threatened Species. The most significant threat to koala populations is habitat loss due to clearing of forests in Australia for urban, industrial and rural development. Loss of habitat not only results in reduced availability to food and shelter but also increased stress. When under stress, koalas are more susceptible to disease that can lead to infertility and death. Another major threat to populations is mortalities due to collisions with cars. In South East Queensland, on average almost 300 koalas are killed each year by vehicles. Koalas are also vulnerable to attacks by dogs. It is estimated that around 75% of koalas attacked by dogs die from their injuries. This figure may be even higher as many cases of dog attacks are not reported. What can you do to help koalas? Support Save the Koala Month, a fundraising and awareness campaign for koalas that runs every September. You can take part by telling people about the plight of koalas and helping raise funds for their protection. Check out the Australian Koala Foundation for more details. If you happen to live in an area with koalas, there a number of ways you can help. Be careful not to hit any koalas while driving, particularly at night when they’re most active. Keep dogs and cats inside at night to reduce the likelihood of attacks.